Let us find guidance in what the Lord tells us, through Scripture. His truth will lead us in to a place of great content, if we allow it. 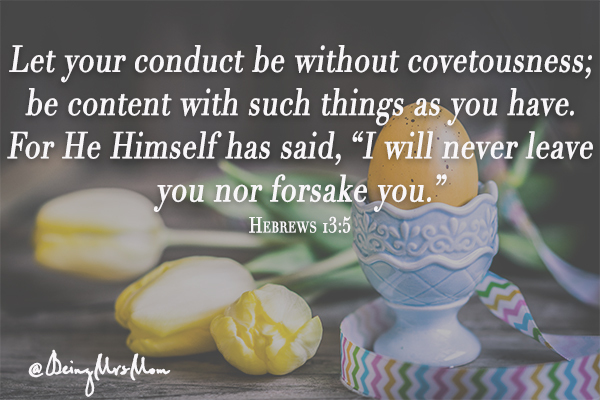 Today, Hebrews 13:5 is an admonishment to be satisfied with life. It is an encouragement to strive, not to gain, but to be content; to look around at what the Lord has so graciously blessed us with, and be thankful for that. This is so different from all that the world encourages us to do. It says, get more, do more, and be more. It tells us to do these things because, well, you never know what tomorrow holds. You might not have this or that tomorrow. You may not be able to acquire the things that you desire tomorrow, so you should strive to get all that you can today. This getting, drains us. It causes us to be overworked, over stretched, and unsatisfied. Yet in his Word, God calls us to be satisfied with all that we have; not to look on the possessions and blessings of others covetously. Why? Therefore, I want to encourage you today, as I have been encouraged by the Word of God, to come out of the fearful place of trying to obtain more. Step in to the place of accepting God’s gifts and be pleased with what you have. Be thankful for all of the blessings that God has provided you.